Day 147: Advertising, originally uploaded by susanvg. This ad hearkens back to the days before billboards. You can see traces of old advertising on older buildings around the city. Often the ads on buildings are for companies or goods that are no longer in existence. Imagine the work of painting these on buildings. They were meant to last - not, as today, rented for a period of time only to be changed when the workers show up again with their paper and glue. And then there are the electronic ads - flashing on screens for moments only to be suplanted by the next one. It's the age of rapid change with anything and everything done to catch your attention, to catch your brain into craving for things. I love these old ads, as well! 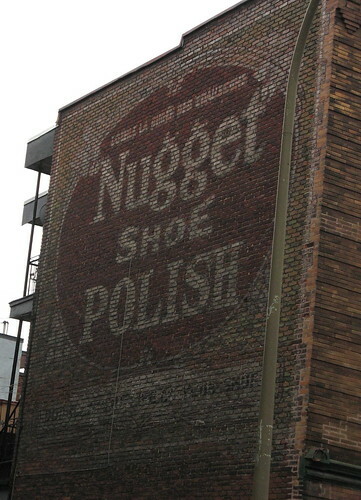 I would love to know how much someone paid to advertise on the side of a building, or perhaps this was the building where the polish was manufactured? There are a few advertisements like these that remain in downtown Duluth. They're on my list of things to blog about during my summer outings. Thanks for sharing this little nugget! Love old painted billboards like this. They are a true treasure. Nice find!